Analysis: Pikachu, good ol' Pikachu. He's been with Ash from his first day. Ash, had been late to his first day, missed all other starter Pokemon, but Professor Oak revealed Pikachu to him. Pikachu's ball was unlike the others, as it had a small lightning bolt on it. Pikachu and Ash did not get off to a good start. Pikachu refused to enter his Pokéball (and still never does, though not for the same reason) and laughed when Ash failed to catch a Pidgey. After an attack by an enormous flock of Spearow, Ash gained Pikachu's trust and they became inseparable. Though only once in "Pikachu's Goodbye" Ash gave Pikachu his consent to leave and stay in a forest of Pikachu, but his Pikachu stayed with him. 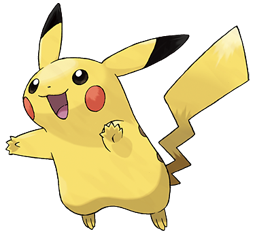 Ash's Pikachu is abnormally strong compared to in-game Pikachus. Ash's Pikachu catches the eye of Team Rocket and they follow the "twerps" in attempt to catch him for Giovanni, though they fail each time. Ash leaves his companions to come to a new region and Team Rocket follows. Each time the females bike is destroyed by Pikachu's thunderbolt when trying to escape Team Rocket. Though in the first season of Pokemon when he meets Misty, her bike is destroyed when trying to get Pikachu to the Pokemon Center. ThunderShock Yes Pokemon, I Choose You! Analysis: Ash obtained Starly while searching for Pikachu (who was stolen by Team Rocket) in the episode "Two Degrees of Seperation". Aipom was swining through trees and bumped into the Starly and they battled. Weakened by Aipom, the Starly was an easy capture for Ash. During a battle against Paul's Starly, Ash's Starly lost. Starly evolved into Staravia in the episode "A Staravia is Born" while battling Team Rocket. Staravia learned Aerial Ace and perfected it immediately after evolution. He did not participate in Ash's first battle against Roark, but helped in the second gym against Gardenia. Reggie inspired Ash to then teach it Brave Bird. It then helped him defeat Maylene.At a PokéRinger competition Staravia evolved into Staraptor and then soon learned Close Combat, thus helping Ash to take out Paul's Honchkrow and win his first victory over Paul. It is confirmed that in the English version, Staraptor is male. Analysis: Ash caught Turtwig in "Gettin' Twiggy With It" near Clara's home. It lived and broke up fights in the forest. When Team Rocket stole Ash's Pikachu their balloon crashed and Turtwig protected Pikachu. After Team Rocket was defeated Turtwig though that Ash and friends were going to wrongfully steal Pikachu, so it attacked them too. He ran off with Pikachu and when they later found him, they worked out the misunderstanding and Turtwig bonded with Ash. As Ash and Co. began to leave, but an old woman encouraged Ash to catch Turtwig, so after a battle, Turtwig was caught. Turtwig was confident for his size and was quite fast. 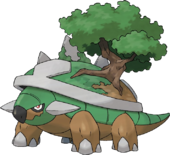 But, after a battle with Paul's Honchkrow, Turtwig evolved into Grotle, and all it's speed was diminished because of it's size. In DP166 (an episode that has not yet been dubbed in English) Grotle was used in Ash's gym battle against Volkner's Luxray, but it was cancelled due to the power going out. Later, Grotle battled Team Rocket in the Sunnyshore Tower and it quickly evolved. Analysis: Paul found Chimchar defending itself and soon added it to his regular team, but then later after a battle with Cynthia, he decided that it didn't live up to his expectations, so he released it and it was later adopted by Ash. It reflected on how it was never treated with care and lvoe in Paul's possesion and cried tears of joy when it realized how much better Ash was. It later came over its morbid fear of Zangoose. 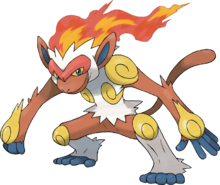 Later, Chimchar was used in a full battle against Ash Chimchar defeated three of Paul's Pokemon, causing it to evolve into a Monferno. In DP163 (yet to be dubbed in English) Monferno battles Barry's Empoleon and gets blasted into the forest by a Hydro Pump and goes on an uncontrollable Blaze rampage but manages to control it in the last second to save Ash's Pikachu, Dawn's Piplup, Paul's Electabuzz and Barry's Empoleon from Team Rocket's mecha that was to crash, and it evolved into an Infernape in the process. Analysis: Buizel originally belonged to Dawn, who failed to capture Buizel on first attempt because of Buizel's incredible speed and accuracy, but soon it gained Dawn's trust when she saved him from a horrible fall. He allowed her to challenge him again and this time she captured him. But when training for contests, Buizel seemed more focused on Ash's training then it was unable to focus on training with Dawn. Ash's Aipom had the same problem, watching and focusing more on Dawn than Ash, so in the end Zoey convinced the two trainers to trade. Buizel is extremely fast and agile, but it needed some new technique, so during a battle with Fantina against her Gengar he developed the "Counter Shield" strategy, but then lost to her Drifblim. In a full battle with Paul, Buizel was sent out to start, but when Paul put in Torterra, Ash switched out right away. Later in the same battle Buizel was switched back in and battled Magmortar, who was switched out when infected with poison. Buizel then fought against Ursaring and usedhis Counter Shield strategy to get some damage, and when hurt later Ash was to recall Buizel, but Buizel insisted on staying in the battle, but was then defeated. Analysis: Ash met Gible with Wilma, and Wilma explained that it was trying to learn Draco Meteor. But the moved always failed; instead of exploding in the sky, it always fell to the ground. Ash wanted to help the Gible, and it soon effectively used the move against Team Rocket, but then later after another try it failed again. The Gible started to follow Ash, so he decided to help it learn Draco Meteor. Each time it still failed and it always hit Piplup, until Dawn got a Togekiss who returned it to Ash and Gible and protected Piplup. Later, Ash met with Gible again and wanted to capture it, but so did Barry. In the end Gible decided to let Ash take it, and so Barry challenged them to a battle, but Gible was defeated by Empoleon. 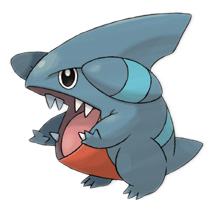 Gible likes to latch onto people's heads, similar to Turtwig, and it has been seen destroying half a central park and such with his bite. Analysis: Bulbasaur was raised by Melanie in the Hidden Village, where it protected abandoned Pokemon. After Ash protected the village from an attack by Team Rocket, Melanie encouraged Bulbasaur to join Ash and she explained that it wasn't growing because it was in the village too long. So it joined Ash and at first it was reluctant to like Ash, seeing as he remembered all the abandoned Pokemon in the village. Over time it grew to trust Ash. It later had the chance to evolve after battling an extremely strong Ryhorn, but refused to do so, despite what an angry crowd of Ivysaur and Venusaur said about him ruining the evolutionary cycle. Bulbasaur remained with Ash up to Johto and was the only one of his original team to do so (beside Pikachu) but he was sent back to Oak's lab so that he could control the other Pokemon. Analysis: Ash obtained Kingler as a Krabby to prove to Misty that catching his other Pokemon was not a fluke. Though, Ash having already six Pokemon in his party, his Krabby was teleported away, much to his surprise. He had no idea where it went, but later learned it was at Professor Oak's Lab. Later in a battle against Mandi Ash used Krabby, despite Misty's attempts to get him to use one of her Pokemon, because Krabby had never battled before. But it managed to defeat her Eggxecutor in an intense battle, causing Krabby to evolve into Kingler. It managed to finish the match by defeating Mandi's last two Pokemon. Later, Ash was considering using it in the Silver Conference, but it was injured. Ash used it in the Whirl Cup agaisnt Misty's Psyduck and Poliwhirl. It now resides in Professor Oak's Lab and has made friends with Ash's Corphish. Analysis: Ash found Muk when traveling through Gringey City. The local power plant was overrun with Grimer, but once the swarm was taken down, the leader Muk challenged the trainers. Ash weakened and captured the Muk and it was sent to Oak's lab right away because it's stench was so horrible that it seeped through the Pokeball. Muk was used only twice, once in the Indigo Plateau Conference when it defeated Jeanette Fisher's high-level Bellsprout. It is briefly used to help find Bulbasaur in a sewer later. Muk battled Gary's Blastoise and Scizor in the Silver Confrence but was defeated without a single win. He was sent to Professor Oak before leaving. Analysis: Ash caught his Tauros in the episode "The Legend of Dratini". In the Safari Zone he tried to capture as many Pokemon as he could, but all he ended up with was 30 Tauros, because the ran in front of his Safari Balls when he was trying to make a catch. All 30 were transported to Professor Oak's Lab. This episode was never dubbed in English, though in a later English episode it is mentioned that Ash caught them in the Safari Zone, though it does not depict it due to the use of firearms being a plot point. Ash used Tauros when he needed a replacement for Snorlax for his battle of the Winner's Cup in the Orange League. He defeated a Venusaur and help defeat Drake's Dragonite, who was finished off by Pikachu. He remained in his Pokeball until the return to Pallet Town where he returned Tauros to the herd. The Tauros was used again in the Johto Pokemon Swap Meet. He again used Tauros in the Silver Cup where he defeated Gary's Nidoqueen. He used Tauros one last time on his return from Hoenn against Salon Maiden Anabel. Analysis: During Ash's travels on the Orange Islands, he, Misty and Tracey noticed a Snorlax that was devouring everything in sight and began to consume all vegetation in the Islands. Ash, Misty, Tracey, Pikachu and Jigglypuff managed to stop the Snorlax, giving Ash the perfect opportunity to catch it. He kept it for the remainder of the Orange Islands, but switched it with one of his Tauros in the finals due to the fact that if fell asleep. Later he used Snorlax in the Johto League competition and quickly defeated Gary's Nidoqueen and Arcanine, but lost to Scizor. Snorlax then fought against Harrison and defeated his Snorlax and Hypno, but was defeated by his Houndoom. Snorlax is to appear in DP182 alongside Ash's other Pokemon. Analysis: Heracross appeared in an episode where Heracross and Pinsir were having a territorial fight. Ash and friends tried to think of a solution and a curios Heracross followed them. The answer came in the form of Team Rocket, who the Heracross and Pinsir teamed up to stop and the Pinsir returned to their forest. The Heracross strayed out of the forest after Ash and friends and it allowed itself to be easily captured. Soon, Heracross was sent to Professor Oak's lab and exchanged for Tauros, and later Ash was ready to switch back but the Professor wished to study Heracross, so it stayed at the lab. In the Silver Conference it managed to defeat Gary's Magmar, but was defeated by his Blastoise. After Ash returned from Johto, he left Heracross with the Professor before his Hoenn journey. Analysis: Chikorita was extremely stubborn and even went up against Ash's Charizard and was injured in the process. Team Rocket tried to get her to join them, but Ash earned her confidence. Chikorita soon developed a sort of crush on Ash, constantly fighting for his attention. Chikorita soon evolves into a Bayleef in order to protect Ash from Team Rocket. Though the Pokemon continued to crush on Ash, seeing how it still jumped into his arms, despite her larger size. In the Silver Conference Bayleef lost to Gary's Blastoise, but made up for it by winning against Harrison's Houndoom. Chikorita was left with Professor Oak when Ash left for Hoenn, and will appear in DP182 with some of Ash's other Pokemon. Analysis: Ash finds a forest of Cyndaquil and decides to search for one. He gets separated from his friends and finds himself in a cave, where he meets Cyndaquil. But sadly, he runs into Team Rocket. He competed with Koji and Team Rocket and eventually won the right to capture the Cyndaquil. At first Cyndaquil was never really powerful and always had to wait for his flames to ignite before using a Fire-Type attack. Soon enough he was able to use his fire at will. Ash left Cyndaquil with Professor Oak when he set off for Hoenn. There is evidence that Cyndaquil will evolve in DP182. Analysis: In an episode Ash and Misty were both trying to catch Totodile, he ran into the bushes. They both threw Lure Balls at him, and one of them caught him. The two battled to see who would get Totodile and Ash won the battle. Totodile is most always happy and loves dancing with high energy. Totodile has two crushes with Quagsire and Azumarill. Ash uses Totodile frequently in Johto in the Silver Confrence and in the Whirl Cup. Ash left Totodile with Professor Oak when he set off for Hoenn. Totodile is to appear in DP182 alongside Ash's other Pokemon. Analysis: Dr. Wiseman was trying to capture Noctowl using traps, not PokeBalls. But Noctowl outwitted him and escaped, leaving Dr. Wiseman hypnotized. Later, the Shiny Noctowl was captured by Team Rocket and rescued by Ash. Ash battled Noctowl with Pikachu and captured it. Noctowl was used in the same way as Pidgeotto, scouting the sky for a missing Pokemon or Team Rocket's balloon. Noctowl greatly contributed to Ash's victory against Morty. Noctowl is mischievous, intelligent and cunning. He was left with Professor Oak when Ash left for Hoenn. Analysis: Ash received Donphan as an egg when he won a competition hosted by breeders. His egg hatched into a Phanpy. Phanpy was the baby of Ash's team and was rarely used though its power made up for its lack of experience. Its only major battle was against Pryce's Dewgong, which he lost. He battled against Macey in the Silver Conference and defeated her Slugma. Ash left Phanpy with Professor Oak but called on it when in the Frontier Challenge. Phanpy battled Team Rocket's mecha and evolved into Donphan in order to take it down. Ash used Donphan in his battle against Pike Queen Lucy and her Seviper. Donphan was more powerful but still retained the same childish personality. Donphan returned to Oak's Lab when Ash left for Sinnoh. Analysis: Ash met Tailow when it was the leader of a flock of Tailow. It stole Max's chocolate and challenged Pikachu to a battle. He took countless Thunderbolts and Ash captured it to prevent it from getting hurt. Tailow evolved into Swellow in a PokeRinger match against Jesse and James's Dustox in order to fly to victory. Swellow managed to beat Wilma's Swellow, though Wilma's used more powerful attacks, like Aerial Ace. This victory inspired Ash to teach Swellow Aerial Ace. 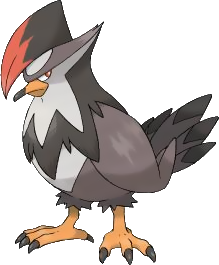 When it was a Tailow it was hardly used like Pidgeotto and Noctowl, but once it hit evolution it became one of Ash's strongest battlers. Ash left Swellow with Professor Oak when he left for Sinnoh. Analysis: Ash met Treecko when he tried to save his old tree home. This led to a battle with Pikachu and Ash caught the Treecko after the battle. Treecko evolved into Grovyle in the middle of a battle with Guy's Loudred. Grovyle was used in the Ever Grande Conference and against the Frontier Brain, Greta. It evolved into Sceptile when Nurse Joy's Meganium (his crush) was kidnapped by Team Rocket. Sceptile lost the use of its ability due to a broken heart until it had to rescue Ash from Team Rocket. Sceptile is one of Ash's strongest Pokemon, strong enough to hold its own against a legendary Pokemon. Sceptile is somewhat of a loner, but he never turns down a battle. He was brought with Ash to the Battle Frontier. It was used against May's Blaziken in the Terracotta Contest in which they both won and they split the medal with the help of Sceptile. He was left with Professor Oak when Ash set off for Sinnoh. Analysis: Ash caught Corphish when he and his friends were camping on the beach and Corphish was attacking them from underneath. Eventually it revealed itself and Ash battled and captured it. Corphish is rather energetic and enjoys being the center of attention. Corphish was afraid Grovyle would take the spotlight because of its new status. It became headstrong and stubborn and when Max used it to battle Vivi, he ignored his instruction of taking it easy on Vivi. In many battles Corphish proved to be a very strong battler. Corphish was left with Professor Oak when Ash left for Sinnoh. Corphish will appear in episode DP182 alongside some of Ash's other Pokemon. Analysis: Ash caught Torkoal when traveling through the Valley of Steel when Torkoal was being attacked by a Skarmory and many Magneton. After Ash rescued it, it cried and ran off after hearing a Steelix. Soon, Ash helped it defeat the Steelix that ruled over the valley and so Torkoal decided to join them. Torkoal is extremely emotional but gets along with everyone. Torkoal seemed to have a friendship with a Spoink that the gang ran into a few times. Torkoal was used by Ash in the Ever Grade Conference. Afterward, Ash left Torkoal with Professor Oak. For his second battle against Brandon's Registeel he swapped out Aipom for Torkoal and was able to put up a fight against Registeel, but he lost in the end. After, Ash sent Torkoal back to Professor Oak's Lab when he set off for Sinnoh. Ever Grand Contest where it proved to be a great battler. Though, Ash left Glalie with Professor Oak when he set out for Sinnoh. Glalie is to appear in DP182 with some of Ash's other Pokemon. Analysis: On the road to Celadon City Ash heard that Gary had already captured 30 Pokemon, and when he heard this he strived to capture more for himself. Soon, a young Mankey ate some of Brock's food, and Ash found this the perfect opportunity to catch it, but the Pokeball failed. This greatly angered the Mankey and he beat up Ash, stole his hat and then mocked him. This greatly angered him and Team Rocket took this opportunity to steal Pikachu. Mankey tried to save Pikachu and ended up being kicked away by James. It became so angry and evolved into Primeape. The Primeape came and beat up Team Rocket and then after beating up Brock it chased Misty and Ash and they all fell into a pit trap set by Team Rocket. Ash tried to catch the berserk Primeape and finally, with Charmander's help, he managed to defeat it. Ash caught it, then released it to beat up Team Rocket, who were sent flying into a nest of wild Primeape. In Celadon City, Ash met a man named Anthony, and they both entered the P1 Grand Prix. Soon, Ash saved Primeape from a nasty fall which gained the usually angry Pokemon's trust. Primeape and Ash won the competition and Anthony asked to train Primeape and Ash agreed and gave him to Anthony. Analysis: Ash found Charizard as a Charmander when it was abandoned by Damian. Charmander then joined Ash and was one of his most used Pokemon at the time. But, when Charmander evolved into Charmeleon it lost its loyalty to Ash, attacking a Paras when trying to lose the battle so that Paras would evolve. Very soon Charmeleon evolved into Charizard in order to take down an Aerodactyl. Charizard obeyed Ash once against Blaine's Magmar. Charizard's disloyalty hurt Ash the most when in the Indigo League Championships, causing Ash to forfeit the fifth round since it refused to battle Ritchie's Pikachu, Sparky. Soon, when the gang set off for the Orange Islands, during his challenge with Danny, Charizard helped indirectly by using flamethrower on Ash, which also happened to hit the ice chunk, forming it into a perfect sled. Charizard returned to Ash's side when Ash stayed up all night to help it when it was frozen by a Poliwrath, which reminded Charizard all that Ash had done for it as a Charmander. Once in Johto, Ash left his Charizard in the Charific Valley with Liza. It hit up a romantic relationship with Liza's Charizard, Charla. Since then, Ash has called upon Charizard to help battle many times, but he is still under the possession of Liza. Analysis: Ash's Squirtle was the leader of a gang called the Squirtle Squad. They were a group of rogue Squirtle who had been abandoned by their trainers. Meowth convinced the Squirtle that Jesse and James were his pets, and they gain their trust. The Squad captures Ash, Misty and Brock in order to take Pikachu, but Ash convinces them to let him go to town to get a Super Potion for Pikachu, who was weak after a Goldeen battle. The Squad agreed, but if he wasn't back by noon the next day they would dye Misty's hair purple (kill her in the Japanese version). When Ash returned with the Potion, Team Rocket bombed the Squirtle Squad once they (Team Rocket) had Pikachu. They ran to the Squirtle Squad's cave, but Ash noticed the leader's shell was stuck and Ash went back to save it. Squirtle used Water Gun to defeat Team Rocket, but the bombings caused a forest fire and the Squirtle helped put it out. After the fire is put out, Officer Jenny appoints the Squirtle Squad as the Fire Fighters of the town, but the leader would rather go with Ash. Squirtle became one of Ash's most trusted Pokemon, but when in Johto, there was an event called the Fire Rescue Grand Prix. It was a competition with water Pokemon to see who were the best at putting out fires, and sure enough the Squirtle Squad was there. Ash's Squirtle led them and when they won, Ash decided that the Squad needed him more than Ash did. Though, Squirtle can be called upon at any time. Analysis: Ash found Gligar when a gang of Gligar and Gliscor became trapped in the city after a violent windstorm. Gligar's attempts to navigate through the city only attracted more Gligar and Gliscor, and they formed a pack. They survived by stealing food from humans and eating fruit from trees. After Ash and co. helped the pack, Gligar decided to let Ash capture it. Gligar appeared mostly when winking and sticking its tongue out. It has the tendency to land on Ash, because of its inability to glide properly. Gligar later evolved into a Gliscor in order to save Ash from falling. Gliscor battled Paul's Torterra in a full battle, but was recalled after it had it's energy drained by Giga Drain. It was later shifted in against Torterra again, only to be defeated by Frenzy Plant. Later, it lost a battle against McCann's Scizor, and after further training with Ash it battled him again, to lose once again. Ash left Gliscor with McCann for further training. Analysis: Ash caught Caterpie in the Viridian Forest without a Pokemon Battle. Misty revealed her fear of bug-type Pokemon, though the Caterpie liked her. That night Caterpie revealed its dream of becoming a Butterfree, but it didn't think it could achieve this, so Pikachu encouraged it. In a battle against a wild Pidgey, Caterpie was severly weakened, but when Team Rocket kidnapped Pikachu, Ash sent in the weakened Caterpie, and despite being mocked by Team Rocket, it managed to defeat Koffing and Ekans. Just as Misty was about to get over her fear and congratulate it, it evolved into a Metapod, which bothered her even more. Soon, in a battle against Samurai, Metapod managed to defeat his Pinsir, despite being only able to use Harden. Then, Samurai sent out his own Metapod, but they both lay stationary, since all they could do was Harden. But, the battle was interrupted by a swarm of Beedrill who stole Ash's Metapod. He ran after them and found it in a nest of Kakuna. Team Rocket appeared and woke the Beedrill with their motto, which Ash used as an opportunity to get back his Metapod. Ash owned up to his wrongdoing and admitted that it was wrong and that he would never abandon his Pokemon again. This touched Metapod and it protected Ash from an attacking Beedrill, who left a huge gash in Metapod, which caused it to emerge and evolve into Butterfree. Ash set Butterfree free eventually, because it was Butterfree mating season, and his Butterfree fell in love with a pink Butterfree. Analysis: Ash caught Pidgeot as a Pidgeotto in the Viridian Forest. Pidgeotto wasn't often used, most of the time it was used to scout paths to the next city, or pop holes in Team Rocket's balloon. Despite this it was used in quite a few Kanto gym battles. Once Ash returned to Pallet Town after the Indigo League it encountered the Spearow that it had tried to capture the first day, but it was now a Fearow. It was harassing the local Pidgey flock. After being injured while trying to lead the flock to safety, Pidgeotto evolved into Pidgeot and led the flock to take down the Fearow. Ash left Pidgeot to guard the local Pidgey, and Ash promised to return for it after he left the Orange League, but he has yet to fulfill that promise. Analysis: Ash met Lapras when it was being abused by three boys who were getting it ready for the Orange League. Ash scared them off with Pikachu's Thunderbolt and Tracey noticed the Lapras needed medical help. He gave Ash a potion to give it while he went to tell Nurse Joy. Lapras refused to take the potion from Ash so they carried it to the Pokemon Center. Nurse Joy explained that it was afraid of humans, but Ash gained its respect when he saved it from Team Rocket. Lapras decided to join Ash. Lapras was used mainly as transportation between the Islands, but Lapras was used in three of Ash's Orange League competitions. Soon, they met the pack that Lapras was separated from, but they hated him for being accompanied by humans, because the Lapras hated humans because Captain Crook hunted them. Ash gained their respect when he saved them from Captain Crook and they allowed Lapras to rejoin them. Lapras met Ash one more time, where it appeared to be the new leader of the pack. Analysis: Ash battled a trainer on the St. Anne to see who was more powerful, and his Butterfree took down the opposing trainer's Raticate easily. The man asked to trade and Ash asked Brock if he should do so. Brock said yes, but he was preoccupied with a woman, so it is unknown if he was one hundred percent sure of this. He traded anyway. He later called out his Raticate against Team Rocket on the ship, meaning for it to be Butterfree, but he forgot he had traded him away. So, Ash asked to trade back, and he wanted his Butterfree so badly, he did so while the ship sank, causing him and his friends to go down with it. Analysis: Ash first met Aipom when she stole his hat when fetching food for a giant Slaking. He returned it by setting it on a rock and later was seen again, and pulled the same hat trick. Ash attempted to catch it, but failed. He met the Aipom again and battled her once more and this time captured her in front of a large crowd. Aipom was confirmed to be female when May mentioned it, then Dawn confirmed it in a later episode. Aipom tends to steal other's hats and is seen wearing many different types of headgear. Aipom sat on Ash's left shoulder when out of her Pokeball, opposite that of Pikachu, who sat on the right. Aipom was sometimes jealous of Pikachu's closeness to Ash. Eventually, Aipom ignores Ash's training because it is more focused on Dawn's Contest Training, so Ash trades Aipom for Buizel. It evolves later with Dawn. Eventually it leaves both Ash and Dawn because it discovers its love and talent for Ping Pong. Analysis: Ash won Beedrill in a Bug-Catching Contest, because the winner got to keep the Pokemon he/she caught. Ash gave the Pokemon to Casey however because of her love for black and yellow striped Pokemon. Beedrill has not yet used moves, so they are unknown.